Karl Kemnitzer has enjoyed designing and building projects ever since his childhood growing up on an apple orchard. At 9 years old he used scrap farm equipment to put a lawnmower engine on his sister's bicycle. Since then the projects have grown more complex, but he has continued to enjoy bicycling and motorcycling because of the simplicity and the sense of place they provide. Transportation is 38% of Vermont's fuel use and 47% of it's emissions, costing $1.5 billion dollars for 380 million gallons of fuel each year. As a member of both his town's Energy Committee and the Executive Committee of the Upper Valley Sierra Club, Karl has tried to minimize the use of his car, but in 2010 he decided to seriously reduce his fossil fuel use. Bicycles were the best option for his rural area, and fortunately electric motors and batteries had greatly improved since his childhood projects. After sketching designs and collecting parts, Karl's Bakfiets solar electric cargo bike rolled down the road in the spring of 2013. The Longtail was out the next spring, and to date they have been at 41 energy and environmental events, presentations, and conferences around Vermont and New Hampshire, with over 300 test rides covering 2000 miles. 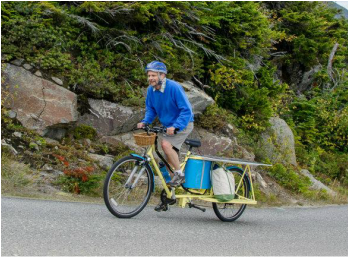 They are regularly used to carry recycling and groceries on 45 mile long errand runs, and the longtail has been ridden up Mt Washington. Feedback from Karl's test rides and data from the electrical recorders on the bikes is being used during the design of the next bikes. Vermont requires both good hill climbing ability, and good cruising speed for getting to the next town. The trade offs between a large battery, motor, or special gearing are being tested. Look for a Cruiser midcargo bike from Karl next! 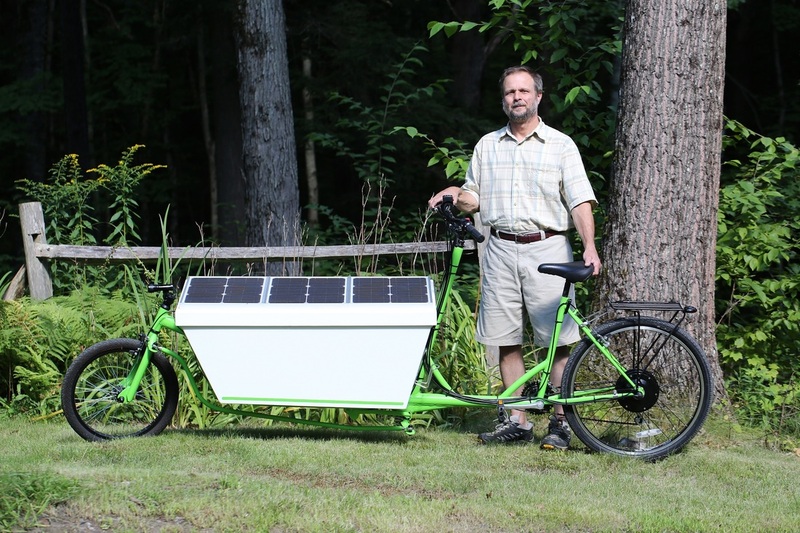 You can visit Karl's blog at http://mysolarelectriccargobike.blogspot.com/ and check out all the fine work he is doing. 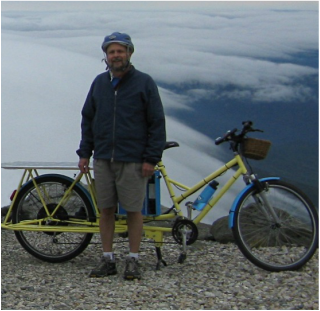 Karl climbing Mt Washington on his handbuilt solar/electric/human powered longtail. Oh yeah, Karl made it to the top of Mt. Washington with relative ease.